Peppermint (Mentha × piperita, also known as Mentha balsamea Wild.) 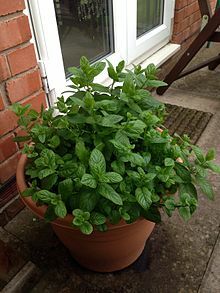 is a hybrid mint, a cross between watermint and spearmint. Indigenous to Europe and the Middle East, the plant is now widely spread and cultivated in many regions of the world. It is occasionally found in the wild with its parent species. It is a herbaceous rhizomatous perennial plant that grows to be 30–90 cm (12–35 in) tall, with smooth stems, square in cross section. The rhizomes are wide-spreading, fleshy, and bear fibrous roots. The leaves can be 4–9 cm (1.6–3.5 in) long and 1.5–4 cm (0.59–1.57 in) broad. They are dark green with reddish veins, and they have an acute apex and coarsely toothed margins. The leaves and stems are usually slightly fuzzy. The flowers are purple, 6–8 mm (0.24–0.31 in) long, with a four-lobed corolla about 5 mm (0.20 in) diameter; they are produced in whorls (verticillasters) around the stem, forming thick, blunt spikes. Flowering season lasts from mid- to late summer. The chromosome number is variable, with 2n counts of 66, 72, 84, and 120 recorded. Peppermint is a fast-growing plant; once it sprouts, it spreads very quickly. Peppermint typically occurs in moist habitats, including stream sides and drainage ditches. Being a hybrid, it is usually sterile, producing no seeds and reproducing only vegetatively, spreading by its runners. If placed, it can grow almost anywhere. Mentha × piperita ‘Candymint’. Stems reddish. Mentha × piperita ‘Chocolate Mint’. Flowers open from bottom up; reminiscent of flavour in Andes Chocolate Mints, a popular confection. Mentha × piperita ‘Citrata’. Includes a number of varieties including Eau De Cologne Mint, Grapefruit Mint, Lemon Mint, and Orange Mint. Leaves aromatic, hairless. Mentha × piperita ‘Crispa’. Leaves wrinkled. Mentha × piperita ‘Lavender Mint’. Mentha × piperita ‘Lime Mint’. Foliage lime-scented. Mentha × piperita ‘Variegata’. Leaves mottled green and pale yellow. 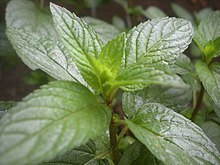 In 2014, world production of peppermint was 92,296 tonnes, led by Morocco with 92% of the world total reported by FAOSTAT of the United Nations. Argentina accounted for 8% of the world total. In the United States, Oregon and Washington produce most of the country’s peppermint, the leaves of which are processed for the essential oil to produce flavorings mainly for chewing gum and toothpaste. Peppermint oil is under preliminary research for its potential as a short-term treatment for irritable bowel syndrome, and has supposed uses in traditional medicine for minor ailments. Peppermint oil and leaves have a cooling effect when used topically for muscle pain, nerve pain, relief from itching, or as a fragrance. High oral doses of peppermint oil (500 mg) can cause mucosal irritation and mimic heartburn. Medicinal uses of peppermint have not been approved as effective or safe by the US Food and Drug Administration. With caution that the concentration of the peppermint constituent pulegone should not exceed 1% (140 mg), peppermint preparations are considered safe by the European Medicines Agency when used in topical formulations for adult subjects. Diluted peppermint essential oil is safe for oral intake when only a few drops are used. Although peppermint is commonly available as a herbal supplement, there are no established, consistent manufacturing standards for it, and some peppermint products may be contaminated with toxic metals or other substituted compounds. Skin rashes, irritation, or an allergic reaction may result from applying peppermint oil to the skin, and its use on the face or chest of young children may cause side effects if the oil menthol is inhaled. A common side effect from oral intake of peppermint oil or capsules is heartburn. Oral use of peppermint products may have adverse effects when used with iron supplements, cyclosporine, medicines for heart conditions or high blood pressure, or medicines to decrease stomach acid. ^ WHO Monographs on Selected Medicinal Plants: Volume 2 (PDF). Geneva: World Health Organization. 2002. pp. 188, 199. ISBN 978-92-4-154537-2. Retrieved October 29, 2010. ^ “Peppermint”. Botanical Online. Retrieved 19 March 2018. ^ a b Mimica-Dukic, N.; Bozin, B. (2008). “Mentha L. species (Lamiaceae) as promising sources of bioactive secondary metabolites”. Current Pharmaceutical Design. 14 (29): 3141–3150. ISSN 1873-4286. PMID 19075696. ^ Dong, Wenjiang; Ni, Yongnian; Kokot, Serge (February 2015). “Differentiation of mint (Mentha haplocalyx Briq.) from different regions in China using gas and liquid chromatography”. Journal of Separation Science. 38 (3): 402–409. doi:10.1002/jssc.201401130. ISSN 1615-9314. PMID 25431171. ^ “Mentha and Schizonepeta”. www.itmonline.org. Retrieved 2019-01-06. ^ Kerry., Bone (2013). Principles and practice of phytotherapy : modern herbal medicine. Mills, Simon (Simon Y.) (2nd ed.). Edinburgh: Churchill Livingstone. ISBN 978-0443069925. OCLC 830314789. ^ “Mentha x piperita – Peppermint – Flora of Northwest Europe”. 2014. Retrieved 29 December 2014. ^ “List of invasive species in the Great Lakes Great Lakes United / Union Saint-Laurent Grands Lacs”. Archived from the original on 2009-04-29. Retrieved 2009-02-07. ^ The Herbarist. Herb Society of America. 1997. p. 39. Retrieved 24 July 2013. ^ “Mentha piperita cv. Chocolate Mint”. Mountainvalleygrowers.com. Retrieved 2013-07-24. ^ Dolf De Rovira (28 February 2008). Dictionary of Flavors. John Wiley & Sons. pp. 420–. ISBN 978-0-470-38484-8. Retrieved 24 July 2013. ^ “Mentha x piperita ‘Chocolate Mint’ : peppermint”. Hortiplex.gardenweb.com. 2007-09-12. Archived from the original on 2014-10-06. Retrieved 2013-07-24. ^ “Mentha x piperita ‘Citrata’ : eau de cologne mint”. Hortiplex.gardenweb.com. 2007-09-12. Archived from the original on 2014-10-06. Retrieved 2013-07-24. ^ “Mentha x piperita var. citrata : lemon mint”. Hortiplex.gardenweb.com. 2007-09-12. Archived from the original on 2014-07-28. Retrieved 2013-07-24. ^ “Mentha x piperita ‘Crispa’ : eau de cologne mint”. Hortiplex.gardenweb.com. 2007-09-12. Archived from the original on 2014-10-06. Retrieved 2013-07-24. ^ “HortiPlex Plant Database: Info, Images and Links on Thousands of Plants”. Hortiplex.gardenweb.com. Archived from the original on 2014-10-06. Retrieved 2013-07-24. ^ “Mentha x piperita ‘Lime Mint’ : eau de cologne mint”. Hortiplex.gardenweb.com. 2007-09-12. Archived from the original on 2014-10-06. Retrieved 2013-07-24. ^ “Mentha x piperita ‘Variegata’ : variegated mint”. Hortiplex.gardenweb.com. 2007-09-12. Archived from the original on 2014-10-06. Retrieved 2013-07-24. ^ a b c d e Stanev, S.; V.D. Zheljazkov. “Study on essential oil and free menthol accumulation in 19 cultivars, populations, and clones of peppermint (Mentha × piperita)”. Retrieved 6 June 2009. ^ a b c Jullien, Frédéric; Diemer, Florence; Colson, Monique; Faure, Olivier (1998). “An optimising protocol for protoplast regeneration of three peppermint cultivars ( Mentha x piperita)”. Plant Cell, Tissue and Organ Culture. 54 (3): 153–9. doi:10.1023/A:1006185103897. ^ a b “Peppermint production in 2014; Crops/Regions/World list/Production Quantity (pick lists)”. UN Food and Agriculture Organization, Corporate Statistical Database (FAOSTAT). 2017. Retrieved 26 September 2017. ^ a b “Peppermint”. Oregon State University, Corvallis; Extension Service. 2017. Retrieved 26 September 2017. ^ a b Pihl, Kristi (24 September 2012). “Washington is No. 1 mint oil producer in U.S.” Tri-City Herald. Retrieved 26 September 2017. ^ Thomson Healthcare (2007). PDR for Herbal Medicines (4th ed.). p. 640. ISBN 978-1-56363-678-3. ^ Dolzhenko, Yuliya; Bertea, Cinzia M.; Occhipinti, Andrea; Bossi, Simone; Maffei, Massimo E. (2010). “UV-B modulates the interplay between terpenoids and flavonoids in peppermint (Mentha × piperita L.)”. Journal of Photochemistry and Photobiology B: Biology. 100 (2): 67–75. doi:10.1016/j.jphotobiol.2010.05.003. PMID 20627615. ^ Robert Irving Krieger (2001). Handbook of Pesticide Toxicology: Principles. Academic Press. p. 823. ISBN 978-0-12-426260-7. Retrieved 11 October 2010. ^ Garrett, Howard (2003). Dear Dirt Doctor: Questions Answered the Natural Way. University of Texas Press. p. 54. ISBN 9781477304143. ^ Singh, Bharat P. (2010). Industrial Crops and Uses. Centre for Agriculture and Biosciences International. p. 144. ISBN 9781845936167. ^ Schmidt, E.; Bail, S.; Buchbauer, G.; Stoilova, I.; Atanasova, T.; Stoyanova, A.; Krastanov, A.; Jirovetz, L. (2009). “Chemical composition, olfactory evaluation and antioxidant effects of essential oil from Mentha x piperita”. Natural Product Communications. 4 (8): 1107–1112. ^ Khanna R, MacDonald JK, Levesque BG (July 2014). “Peppermint oil for the treatment of irritable bowel syndrome: a systematic review and meta-analysis”. Journal of Clinical Gastroenterology. 48 (6): 505–12. doi:10.1097/MCG.0b013e3182a88357. PMID 24100754. ^ Ruepert L, Quartero AO, de Wit NJ, van der Heijden GJ, Rubin G, Muris JW (August 2011). “Bulking agents, antispasmodics and antidepressants for the treatment of irritable bowel syndrome”. Cochrane Database of Systematic Reviews. 8 (8): CD003460. doi:10.1002/14651858.CD003460.pub3. PMID 21833945. ^ a b c d e “Peppermint oil”. National Center for Complementary and Integrative Health, US National Institutes of Health, Bethesda, MD. 2016. Retrieved 13 July 2015. ^ a b Keifer, D.; Ulbricht, C.; Abrams, T.; Basch, E.; Giese, N.; Giles, M.; DeFranco Kirkwood, C.; Miranda, M.; Woods, J. (2007). “Peppermint (Mentha xpiperita): An evidence-based systematic review by the Natural Standard Research Collaboration”. Journal of Herbal Pharmacotherapy. 7 (2): 91–143. doi:10.1080/j157v07n02_07. PMID 18285310. ^ R. Eccles (1994). “Menthol and Related Cooling Compounds”. J. Pharm. Pharmacol. 46 (8): 618–630. doi:10.1111/j.2042-7158.1994.tb03871.x. PMID 7529306. ^ M. G. Kains (1912). American Agriculturist, ed. Culinary Herbs: Their Cultivation Harvesting Curing and Uses. Orange Judd Company. Archived from the original (English) on 2007. ^ a b c d e “Peppermint”. Drugs.com. 2017. Retrieved 11 November 2017. 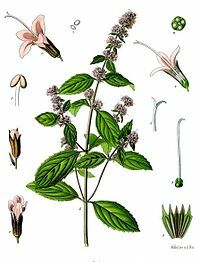 ^ a b c “Community Herbal Monograph on Mentha x piperita L., aetheroleum“ (PDF). Committee on Herbal Medicinal Products, European Medicines Agency. 31 October 2007. Retrieved 11 November 2017. ^ Nair, B (2001). “Final report on the safety assessment of Mentha piperita (Peppermint) Oil, Mentha piperita (Peppermint) Leaf Extract, Mentha piperita (Peppermint) Leaf, and Mentha piperita (Peppermint) Leaf Water”. International Journal of Toxicology. 20 Suppl 3 (4): 61–73. doi:10.1080/10915810152630747. PMID 11766133. ^ International Organization for Standardization. “ISO 5563:1984 Dried peppermint (Mentha piperita Linnaeus) — Specification”. Retrieved 7 June 2009. ^ International Organization for Standardization. “ISO 856:2008 Oil of peppermint (Mentha x piperita L.)”. Retrieved 7 June 2009.